Chelsea remain two points adrift of Premier League leaders Liverpool after beating 10-man Swansea. Swans defender Chico Flores was sent off in the 16th minute after being booked twice inside 120 seconds. It was the second time inside a week that the striker has been the Blues' match-winner, having scored the winner against Paris-St Germain on Tuesday. Defeat leaves Swansea 15th in the table, just three points above the relegation zone. But Chelsea's concerns are at the other end of the table, with a victory vital for Jose Mourinho's side after Liverpool's 3-2 win against Manchester City earlier in the day. That triumph moved the Reds five points clear of their London rivals, but the Stamford Bridge side returned that gap to two - and moved five ahead of Manchester City - with four Premier League matches remaining. Chelsea's run-in includes a visit to Anfield and Mourinho's men needed three points in Wales to keep the pressure on but the game was an open encounter before Flores's dismissal. Chelsea should have led inside five minutes, Mohamed Salah hitting the outside of a post with the goal at his mercy after Branislav Ivanovic's low cross found him in space 10 yards out. However, Swansea also looked full of attacking intent and Petr Cech was called into action to turn Wilfried Bony's header over the crossbar. The complexion of the match would soon change, though. Flores, who had been booked for bringing down Willian just a minute earlier, fouled Andre Schurrle and, after a long delay, referee Phil Dowd showed the Spaniard the red card, provoking a furious response from Swansea head coach Garry Monk. Consequently, Chelsea pinned back Swansea for the majority of the half, Salah missing another fine opportunity after a neat lay-off from Ramires. However, such chances were scarce and their profligacy left the visitors vulnerable to counter attacks. Indeed, from one such Swansea break, Cech again had to produce a fine save to turn Nathan Dyer's 25-yard drive behind after it had deflected off Cesar Azpilicueta. Knowing that Liverpool had stretched their lead at the summit, Mourinho supplemented his attack by introducing Samuel Eto'o to partner Ba as Chelsea laid siege to the Swansea goal. Both strikers went close to making the breakthrough, as did Oscar, but a goal was still not forthcoming. The Blues' frustration grew, perhaps informed by a run of three consecutive away defeats and their failure to keep a clean sheet on the road since February's win at Manchester City. And things nearly got worse. Swansea winger Wayne Routledge surged forward and his shot deflected off John Terry's back, beyond Cech, but narrowly wide of goal. However, Chelsea's nerves were settled shortly after, Ba latching on to Nemanja Matic's long pass before firing the ball into the net. Match ends, Swansea City 0, Chelsea 1. Second Half ends, Swansea City 0, Chelsea 1. Foul by David Ngog (Swansea City). Corner, Chelsea. Conceded by Jonathan De Guzmán. Attempt blocked. Samuel Eto'o (Chelsea) right footed shot from the right side of the box is blocked. Attempt blocked. Oscar (Chelsea) right footed shot from outside the box is blocked. Assisted by Samuel Eto'o. Offside, Chelsea. Mohamed Salah tries a through ball, but Samuel Eto'o is caught offside. Corner, Swansea City. Conceded by Petr Cech. David Ngog (Swansea City) wins a free kick in the defensive half. Corner, Chelsea. Conceded by Jonjo Shelvey. Attempt missed. Mohamed Salah (Chelsea) left footed shot from the centre of the box is close, but misses to the right. Assisted by Oscar. Substitution, Swansea City. Jonathan De Guzmán replaces Leon Britton. John Obi Mikel (Chelsea) is shown the yellow card for a bad foul. Offside, Chelsea. Nemanja Matic tries a through ball, but Samuel Eto'o is caught offside. Attempt missed. Samuel Eto'o (Chelsea) right footed shot from the centre of the box is close, but misses to the left. Assisted by Mohamed Salah. Attempt blocked. John Obi Mikel (Chelsea) right footed shot from outside the box is blocked. Assisted by Willian. Delay in match Samuel Eto'o (Chelsea) because of an injury. Attempt blocked. Samuel Eto'o (Chelsea) right footed shot from the centre of the box is blocked. Assisted by Oscar. Offside, Swansea City. Jonjo Shelvey tries a through ball, but David Ngog is caught offside. Hand ball by Willian (Chelsea). Substitution, Chelsea. John Obi Mikel replaces Demba Ba. Attempt missed. 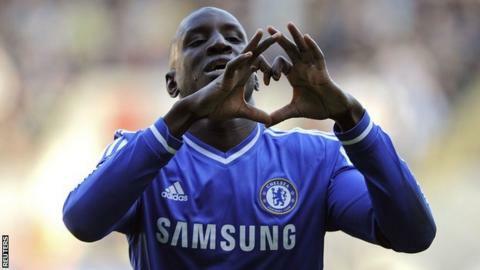 Demba Ba (Chelsea) right footed shot from outside the box is just a bit too high. Assisted by Mohamed Salah. Corner, Chelsea. Conceded by David Ngog. Corner, Chelsea. Conceded by Michel Vorm. Substitution, Swansea City. David Ngog replaces Nathan Dyer. Goal! Swansea City 0, Chelsea 1. Demba Ba (Chelsea) left footed shot from outside the box to the bottom left corner. Assisted by Nemanja Matic.